It was 1987 when Paul Verhoeven brought us the first RoboCop. Later came two unsuccessful sequels, but we won’t acknowledge those except to say that RoboCop was a really cool idea for its time. Speaking of time, it was only a matter of time until a remake had to be done. 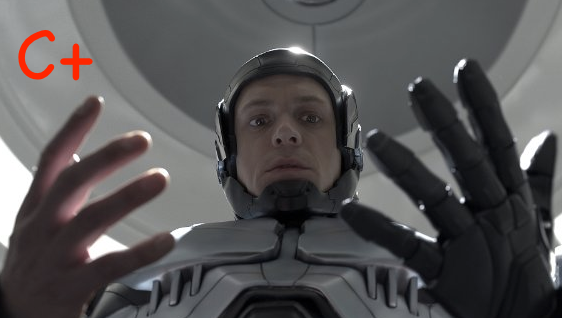 Replacing Peter Weller as Alex Murphy is Joel “The Killing” Kinnaman. Unlike the first film where we got little to no emphasis on a family, Murphy’s family (his wife and son – Abbie Cornish, John Paul Rutton) play rather big parts in the drama. I honestly didn’t think they’d even try to have anything more than robots and a “tough guy” script. I admit, I was pleasantly surprised! With the use of droids still outlawed to replace police in a crime-sunken Detroit, a multi-international Omnicorp finds a way around the issue by placing a man at the heart of a well-honed and computer-perfected machine. What better opportunity to try this out than when Detective Murphy, a dedicated father and husband who is nearly killed in the line of duty, gets a second chance—at life and at the work he loves doing? 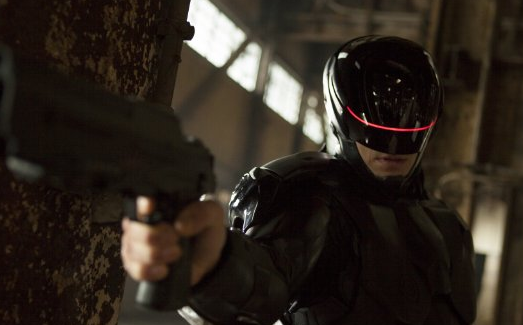 Set in 2028 with an almost apocalyptic aura about the atmosphere, the new RoboCop does a decent job at delivering to us a satisfactory sci-fi experience, as well as bring a retro-80s tributary action-er. Although none would miss how often it jumps into overkill with its use of distracting computer-generated imagery, its efforts to reinvent the story actually worked. However, the film has a bit of a tonal struggle. It has trouble filtering elements of comedy, drama, and just telling its story. The screenplay gets bogged down very often in national news segments where Samuel L. Jackson (as a clownishly outspoken TV personality, “Pat Novak”) tries to do what amounts to a troubled expose of why the nation’s leaders refuse to adopt robots to keep police officers from being killed in the line of duty. How Padilha didn’t see this as coming back to bite the credibility of the whole project is beyond me! Lined up back to back with the original film, this one, in a few small ways, surpasses its predecessor. Kinnaman did more than make the role work for him. He made us believe in him, at places, making us contemplate the shock/horror of adapting to a new body (something the first film never really even attempted to do), but it loses out in terms of its utter gracelessness and a complete lack of finesse. The choppy plot structure certainly did it no favors. But for those wondering, yes, RoboCop does battle the ED-209s. The movie succeeds at making us watch and (eventually) care for what transpires on screen, but I wanted to see more awe and less depressing struggle. It is more story-focused than action-focused, and make no mistake that the nuances of human nature/duplicitous character are well put to use in this film from practically every angle. Audiences will have different opinions, and it’s not going to take home any awards, but it will (like the first film) make an impression. Watched Robocop 2014 Movie and i felt it wasn't as good as the franchise is expected to put to the public.. But overall its a decent movie.